You’ve taken time to carefully select the right location and to design promotions and communications to draw people to your booth. 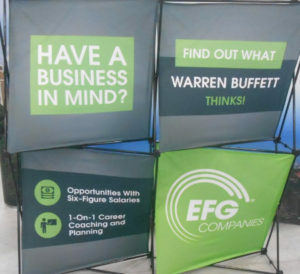 Now let us help you “Wow!” them with trade show displays. 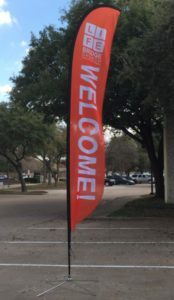 In addition, we have the right signs to help you promote your show appearance in advance using banners or posters that complement your other marketing efforts. These displays are affordable and easy to put up and take down and are easy to transport. They may be just the thing to communicate your services to trade show guests. During a show, you have a small window of time to communicate your key points, establish a connection, and be relevant. Trade displays are a key component of making this happen. Call us today! High Value Signs & Studio is a full-service sign company serving Dallas, Fort Worth, Hurst, Irving, Coppell, Lewisville, Grapevine, and Flower Mound and surrounding cities. We are licensed and insured as a Texas electrical sign contractor (TSCL# 18778). 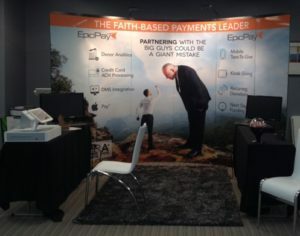 We do trade show displays and booths, vehicle wraps and graphics, wall and floor graphics, lobby signs, building signs, monument signs, custom wall coverings, dimensional letters, and much more! We are a WBENC certified woman-owned business enterprise to support your diversity goals. © you can find out more prednisone for purchase High Values Signs & Studio 2017. Site developed & maintained by WSI.